I recently came back from a nice little trip to Europe, relying on my handy Charles Schwab Visa Platinum Debit Card to get me through my vacation ATM-fee free. After all, none of the banks I do business with here in the United States have ATMs in far out places like Greece, Turkey, Italy, or France. At least none that I’m aware of. If you sign up for a Schwab One Individual Brokerage plus Schwab Bank Investor Checking account you can get your hands on the coveted Charles Schwab Visa Platinum Debit Card. This special piece of plastic refunds all ATM fees, worldwide, with no limit. The caveat is that you need to sign up for the aforementioned account, which is somewhat time consuming (as that long name implies). Once you get your account package in the mail, you’ll also need to fund your Schwab Bank High Yield Investor Checking account to get your debit card. I just deposited $50 to get the ball rolling. After receiving the card, I put in a couple grand for my Euro trip so I could avoid ATM fees and not think twice about pulling out money. Had I used my Wells Fargo ATM card, I would have been hit with a $5 fee every time I pulled out cash since ATM cash withdrawals outside the U.S. are levied with exorbitant fees. You may also get hit with a foreign transaction fee for purchasing Euros with dollars. And because it’s not wise to pull out a ton of cash all at once, you tend to use ATMs frequently while traveling. Unless you want to cruise around with $1,000+ cash in your wallet and be a sucker. This makes the Schwab Visa Platinum Debit Card a veritable no-brainer. It’s a free interest-bearing checking account and you receive a rebate for all ATM fees with no limit. What’s not to like? Most U.S. banks will hit you with the ATM fee and another fee for foreign transactions at said ATMs, so it can get expensive to pull out cash. And yes, cash is a necessary evil when traveling abroad, even if many places do accept credit cards. I often find it easier to just use cash rather than deal with plastic, especially for the many small purchases I make along the way. Think a bottled water here, a metro ticket there, a beer at a bar, a small bite, etc. You won’t want to keep swiping, and merchants will probably tell you to take a hike if you try. At the end of the month, Schwab reimburses you for any ATM fees you paid. You’ll see them on your monthly statement around the last day of the month. I actually only had one ATM fee reimbursed because none of the ATMs in Europe charged me a fee. So it seemed like nothing actually happened. But I used an ATM six times during my 10-day trip. That would have set me back $30 just for the foreign ATM fees, and possibly more if Wells Fargo decided to hit me with a foreign transaction fee as well. The $3 fee you see rebated is actually from a Wells Fargo ATM I used stateside to test the card before setting off on my trip. It’s always good to test. Before I left, I told Schwab I was going to Europe so my debit card would actually work when I got there. I patted myself on the back for being responsible and was excited to use the card once I arrived. As noted, I used the card to withdraw money on multiple occasions, only pulling out small amounts like $150 here or $200 there to pay for certain things in cash. Had I been carrying a card that charged me every time, I’d have probably pulled out larger amounts and been more stressed. I assumed the ATM machines were screwy and kept trying. Finally, when I was down to just a small wad of Euros and some loose change in my pocket, I inquired with the banks. They weren’t much help, what with the language barrier and the fact that I wasn’t a customer. Finally, I went to my hotel and called Schwab via the international collect call number listed on the back of the card. I got a rep fairly quickly and asked what was up – they noted that I attempted to use my card at an ATM that is blacklisted, despite being a large Italian bank’s ATM. As a result, Visa apparently told Schwab to freeze the card so I couldn’t withdraw any more money. That itself was fine, but what wasn’t okay was the lack of a notice. I literally attempted to pull cash out of like 10 ATMs before calling Schwab. Had they texted, called, or e-mailed me about the breach, I wouldn’t have had to waste my time running around Paris trying to withdraw cash. Trust me, you have my e-mail address…how do you think I get those near-daily promotional e-mails from your company? They had plenty of accurate contact info but didn’t bother using any of it. Don’t give me the runaround. Admit you screwed up and we can move forward. Moral of the story is to carry a backup debit card because it doesn’t sound like this is an uncommon situation. And if your card stops working, contact Schwab right away, if you can. 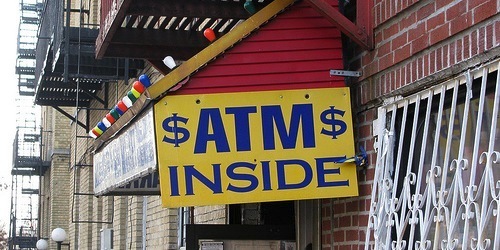 Also avoid shady looking ATM machines. Perhaps use the ones inside bank branches as opposed to the ones outside on the street. Fortunately, I was able to get by on plastic the rest of the trip, and it was kind of fun, a weird kind of money-saving game I played to avoid using cash the rest of the way. That is a pretty lame story. What you are saying is that Schwab is amazing for saving you a lot. What you are also saying is that you can’t be bothered to make a simple FREE call until AFTER TEN attempts. Seriously? You seem to be quite inexperienced/naïve as a traveler. Disagree, a simple text/e-mail from Schwab would be very easy for them, much easier than me making a supposed free call from abroad, especially if the card is denied 10 times. It’s called an alert and they should automatically send them for potential security issues. Every other company calls, texts, e-mails in these situations. I concur with John. The first thing I would do in this scenario is I would check with the issuer of the card. Given the amount of fraud and data theft that is taking place nowadays. I have had the card for about 2 years now and had zero issues. Do not blame others for your inability to reason and think critically. Hopefully you can use this as a learning experience. Thank you for shedding light on my inability to reason. I do hope I can grow and learn from this. As an aside, I just went abroad and used a Wells Fargo debit card and was notified via text immediately any time I did anything with the card. So again, text alerts…a useful thing. I am a rich Republican, therefore a Charles Schwab client. The VISA debit card is useful as I take vacations every couple of weeks. Always call them right away before visiting too many ATMs and wasting your time. Time is always more valuable than money! I agree it’s useful, I just wrote this post to caution people about what could happen while abroad. I love the Schwab debit card and use it whenever I travel as well, just be mindful that you might not receive an alert if something goes awry. I told them of my travel plans before I left and still wasn’t notified once the card got blocked. A simple email would have sufficed and I’d have zero complaints. Next Next post: Discover Will Soon Work with Apple Pay: Time to Apply and Earn 23% Cash Back?